While I enjoy the characters and relationship systems of the Fire Emblem series, the turn-based strategy elements were always something I never really took a shine too. I did find some fun in the combat systems, but it was always the characters themselves that I kept coming back for. Fire Emblem Warriors in some ways works towards the opposite of this dynamic by offering extremely fun and addictive combat but doesn't do a whole lot with the characters themselves. That being said, Fire Emblem Warriors is still a wonderful addition to the franchise, if a bit bland in its storytelling as it doesn't attempt to create a compelling narrative, despite including a huge roster of Fire Emblem greats. You'll start the game with the pair of royal twins; Lianna, and Rowan. Their kingdom is under attack and the pair lose their mother in the chaos, forcing them to flee from the castle to survive. It isn't long before you are joined by Chrom and a few other characters from Fire Emblem: Awakening. Eventually, the game will sprinkle in a few characters from Fire Emblem: Fates and a small sampling from even earlier versions, with the likes of Marth, Caeda, and Tiki, joining the fight. The problem with how the game introduces some of the characters is that it repeats the same situations over and over again. 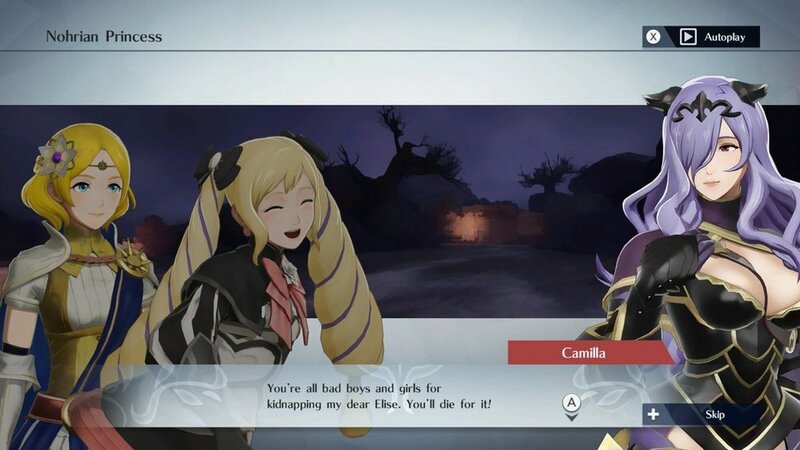 During a few early moments in the game, you'll come across a new character and they'll join you in battle only to be found by one of their friends who then accuses you of kidnapping them and a battle ensues to right this supposed wrong. This style of storytelling happens numerous times and becomes old very quickly. The core story to Fire Emblem Warriors is, as I've said, nothing special. The world is under attack from an ancient evil and said evil must be sealed away through a mystical shield that requires magical stones that several of the classic Fire Emblem characters have within themselves. The story features your typical twists with the shield being captured by the enemy, the ancient evil being summoned, and the heroes coming together to destroy said evil. There isn't a single moment in this game that is shocking and everything is very much predictable. During the 21 chapters to the story, you'll be joined by nearly twenty characters who can swap places with others on the battlefield and become real assets once you have built them up. Each character can learn attack, defense, and boost abilities that allow them to hit harder, take more hits, or learn new classes and weapon types to make them even more effective in combat. The new classes even come with some fancy new costumes, but sadly, these outfits don't show up in the numerous cutscenes and it can lessen the appeal of having them. To learn these abilities you'll need various materials and you'll earn these as you play. For a character like Lianna to allow her Awakening gauge to fill faster, you'll require certain materials like a silver soldier's helmet, a pair of Soldier's Waist Guards, and a few Captain Lances, not to mention a small amount of gold. You'll be flooded with these materials and you can even use boosts to ensure they drop at a much higher rate. With a cast as large as this game has, you'll need to concern yourself with which characters you'll want to invest these materials in and which weapons you'll want to use to upgrade the arsenal of your favorites. Should characters fall behind in levels, you can use gold to level them up faster and keep them relevant with the rest of the cast. Fire Emblem Warriors, much like the Legend of Zelda-filled Hyrule Warriors, is a Dynasty Warriors game through and through. You'll have a map in the top right showing you the various forts to capture and the targets you must take down. Each location is filled with hundreds of enemies that are there to simply kill and build up your special attack meter to then use on the much larger and more difficult foes. While the actual gameplay is incredibly fun and features some very intense moments of having to run back and forth from objective to objective, there isn't a lot of variety in those objectives and you end up doing a lot of the same things over and over again. The mini-map in the top right is also not the greatest at conveying information as there are so many icons in such a small space that it can be hard to tell where you need to go, what direction you are facing, and other much needed to know information. Often, I would have to pause the game and check out the menu-map as it is much larger and easier to understand what is needed to be done and if any sections of the map are locked by special doors, spells, or areas that you'll need to trigger the doors to open. This pausing the game to check the larger map broke the flow of combat often, as does the excessive menu prompts when a character levels up, and my word does this game ever love its prompts. From the paused menu-map, you can select units that you are not in control of and then send them to certain unlocked areas on the map. While you can only take control of four units as playable characters, several support units are also present that you can give orders to or use to pair up with your playable forces. This pairing up allows a secondary character to serve as a stat boost to the main character. Should you pair up two playable characters, then you can swap back and forth between them. The non-playable characters can be given a special attack to use as a support strike and often will join your main character in their special attacks as well. This pairing up as well as attacking enemies within range of another character will build up the relationship between the two, but not to the extent of the main series where you could create time-displaced children to join you in battle when characters would fulfill certain relationship goals. The core combat here is fairly simple and often becomes a button-mashing fest of regular attacks and stronger attacks. 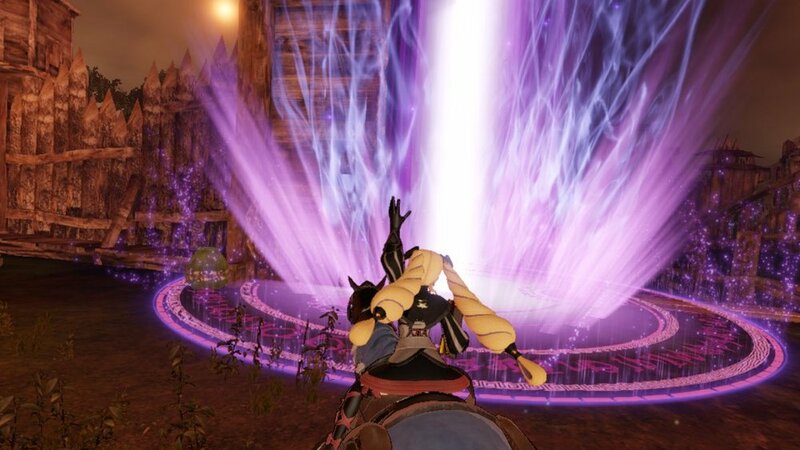 You have your awakening gauge that boosts your attack power by granting weapon type advantage over all weapon types, and a warrior's special attack that results in a massive strike that can decimate dozens upon dozens of nearby enemies. In typical Fire Emblem fashion, the weapon triangle returns and sees swords strong against axes, axes strong against lances, and lances strong against swords. When you're at weapon triangle advantage, damage dealt is increased, the stun gauge appears more often, and the strength of critical hits are boosted. When you are at a disadvantage, the very opposite results and can lead to you taking a dirt nap fairly quickly. Apart from the mentioned weapon types, there are also bows, and these can easily destroy flying units, so sending in dragon or pegasus mounted party members to locations filled with archers is a very bad idea. Unless you give your teammates certain tasks to do or tweak around with the auto play settings, the characters you currently are not playing as are fairly dumb. They will often attempt to take random forts, returning to those already captured, or just stand there doing absolutely nothing. While I never found I needed to babysit them every minute of every match, I often would give them a task, go kill things and give them another task after I completed what I needed to get done. About the only times where I wish the AI was more engaged was during a mission where you need to keep someone alive, they mostly just sat there instead of defending him. Had I played on a much harder difficulty, then maybe this could have been a far more drastic issue. The game features the ability to lower resolution for a higher framerate and this allows the game to feel far more fluid and also allows the included co-op mode to run far better when performance is checked on. This setting can be switched on once you've completed the tutorial mission and start to get into the real meat of the game. Co-op ran fairly smoothly with only a few dips here and there when the action got extremely intense. While the game being played portable is locked to 720p 30fps, I found it far more enjoyable on the go than docked and played on tv. It could be due to how simple the game is, but for those wanting to enjoy the game on the big screen, you can choose between 30fps at 1080p or 60fps at 720p. After completing the campaign you can either tackle the missions at a harder difficulty, grind characters to reach max upgrades, or attempt the History mode, a set of scenario's ripped from the history of Fire Emblem's past. The mode features some high tier items as rewards while featuring some very difficult bosses as well. It's also a nice way to earn Master Seals, items needed to upgrade the class of your existing characters. The game will also feature a host of DLC chapters and additional characters when available. Fire Emblem Warriors is a decent looking game and converts the normal 2D aesthetics of Fire Emblem to 3D quite well. Various Fire Emblem games have featured some 3D elements before, but nothing to this extent. Each character has a nice amount of detail and the cel-shaded look complements the game well. 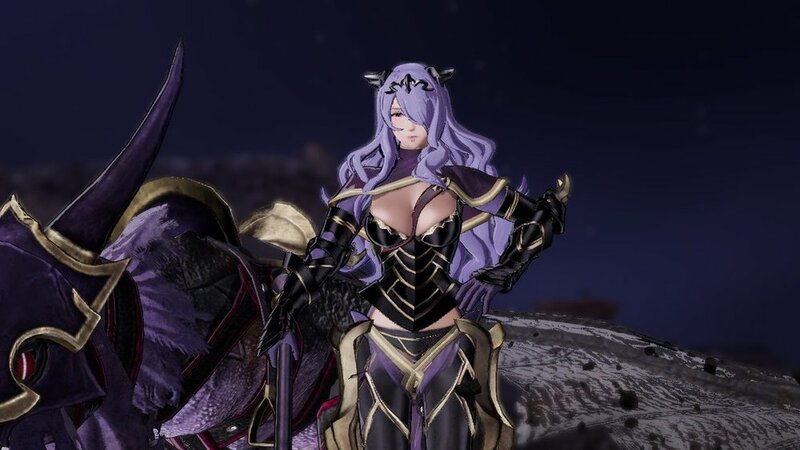 I do wish that older characters had some slight redesigns to them as they obviously look the most plain out of the entire cast, as characters like Camilla, Lucina, and Corrin, all have wonderful detail to them in both their regular outfits and their upgraded class as well. There is a lot to enjoy here if you are either a Dynasty Warriors fan, Hyrule Warriors fan, or just a fan of the Fire Emblem series in general. It is certainly not your typical entry in the series and that may not sit well with those who are faithful to the turn-based strategy combat of the main series. The Warriors template is based around completing similar objectives with very repetitive combat, but the fact you can change up your teams with a such a wide range of Fire Emblem mainstays gives the title a break from becoming too much rinse and repeat. 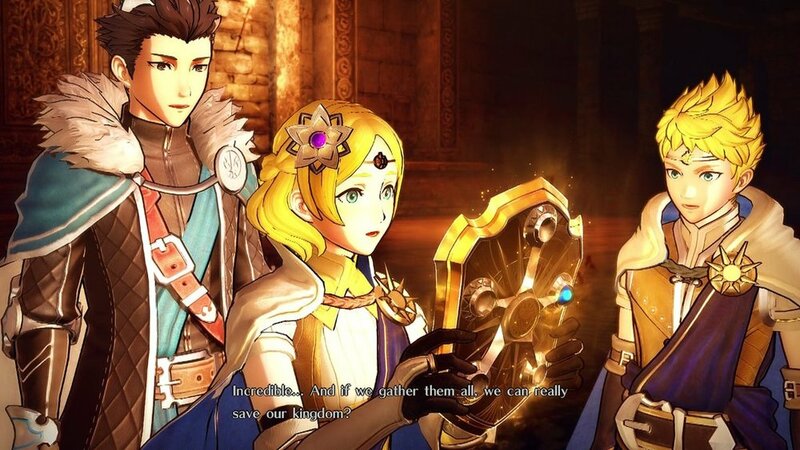 The twins; Lianna and Rowan, are forgettable characters that come off as extremely generic and far too predictable, and the excessive focus on them comes at the cost of pushing the established Fire Emblem characters way into the background far too often and many of the cutscenes don't even feature all the characters that are present during the missions themselves. Despite that, you can totally choose to ignore them and run around as your favorites, I just wish the story would have ignored them as well. fire emblem warriors WAS PURCHASED BY THE REVIEWER.